EAGLE COUNTY, Colorado – Sometimes, it’s good to step back and look at the big picture in life. And then there’s small claims court. 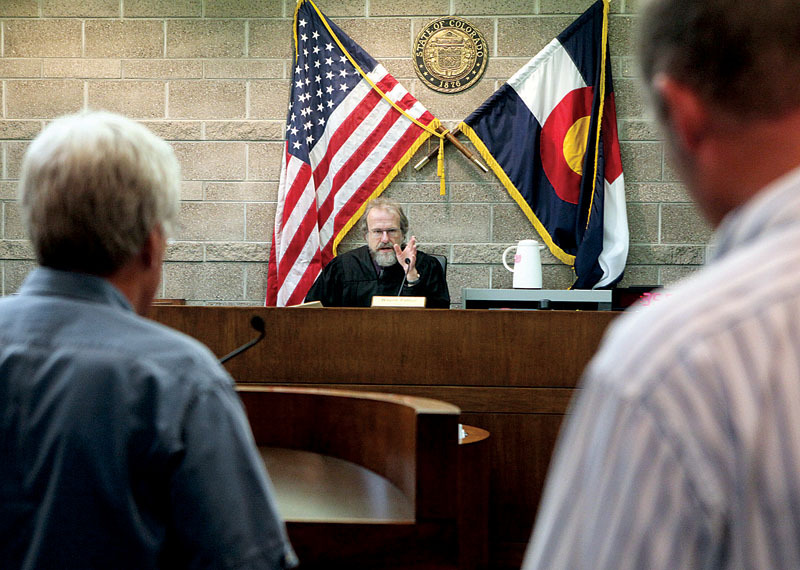 Whether a plumber claims he never got paid for fixing a toilet or a vet claims he got stiffed for a dog surgery, the small claims court in Eagle County is one avenue for seeking justice – up to $7,500 worth, anyway. Wayne Patton, an affable judge who presides over the cases, compares his role to an umpire. He has to call a ball or a strike. “Somebody ain’t gonna like it,” he said. For that reason, Patton gives people a chance to settle their disputes before their trials start at the Eagle County courthouse. Since 2007 the court has been requiring both sides to meet with volunteer mediators before the cases proceed. “If people can work it out between themselves, they’re usually much happier,” Patton said. In general, small claims court is supposed to give people a relatively quick way to resolve their disputes without having to pay for a lawyer, he said. So far, the process has worked pretty well for Casey Frehe, an Edwards resident who owns a construction and electronics company. He filed small claims twice several years ago when customers failed to pay for his services. He won both times. “Small claims can be done financially inexpensively for both sides as long as both sides agree and don’t want to complicate it with a bunch of b.s.,” he said. Although Frehe won his cases, no one just whipped out cash and paid him. Instead, he had to chase after the money. “The process is lengthy and arduous,” he said. That’s one scenario that catches some people off guard, Patton said. “A lot of people think: ‘Well, I’m going to come in and walk out of here with a pile of cash,'” he said. In reality, if someone wins in court, all the winner gets is a judgment that gives him or her the right to make the other person pay, Patton said. “If the other party doesn’t have assets or is good at hiding their assets, it can be difficult, time consuming and nearly impossible (to recoup the money),” he said. There is one more step. Winners can work with the court and the sheriff’s office to garnish the defendant’s wages or put a lien on his or her property. However, “It’s hard to do, and it’s complicated,” Patton said. Roger Villeda says he’s still waiting for the money he claims a woman owes him for fixing her furnace. “She called me and said, ‘Oh, I’m freezing. I need service in my furnace. It’s not working,” he said. Villeda, who owns Eagle Valley Plumbing and Heating, said the woman agreed to a price before he repaired the furnace but changed her tune after he finished the work. He claims the woman still owes $400, and while he recently won his court case, he has yet to see a dime. “How did I win the case if she didn’t show up and I still don’t have the money?” he said. Small claims have been on the rise since 2006, the oldest data available. The number of claims filed in Eagle County has increased from 207 in 2006 to 276 in 2009. So far this year, people have filed 147 small claims. Patton said he couldn’t pinpoint why the claims have been rising. Frehe has a theory, though. “Right now the economy is causing people to not want to pay their bills,” he said. Patton has some advice for people who are thinking about filing a small claim. First of all, bring evidence. “If you gave somebody a written demand for something, it’s real nice to come in with a copy of it,” he said. Another fact that people don’t always realize is that the person who is being sued has the right to countersue for up to $7,500. “If you have a counterclaim, tell us about it,” he said. Although some people walk away from their small claim no richer than they started – or, in the case of a successful counterclaim, poorer than they started – some people say the system has worked for them. Tim Speck, an Eagle landlord, said he resorted to small claims a few times because tenants simply “bagged out” on their rent. Overall, the claims worked out in his favor. The tenants paid the money they owed on the spot.